Enjoying a Tipple | CowParade New Figurines | One Price Low Flat Shipping! From the CowParade Medium Figurine Collection, Enjoying a Tipple cow figurine. Designed by artist, Ocean Forest Lutheran College. Featured at the CowParade Margaret River 2010 exhibit. Made of resin. Measures 8" tall. 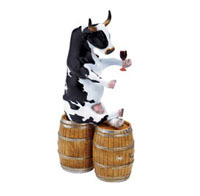 This funny painted holstein cow is propped up on a couple wine barrells with its hooves crossed having a little tipple!